« My gift from my Secret Santa arrived! As most of you know, I received this book through The Book Blogger Holiday Swop and was seriously looking forward to getting stuck in. It only took me a couple of days to read, due to it being a smaller book than his usual fare. It probably would of taken less time to read if I had had uninterrupted reading time, but alas, that was not to be. 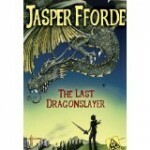 I really enjoyed this, it was short, sweet and had the characteristic Jasper Fforde characters. If you haven’t read him before, this is not a bad one to start off with. ‘Jennifer Strange runs Kazam, an employment agency for soothsayers and sorcerers, but work is drying up. Drain cleaner is cheaper than a spell, and even magic carpets are reduced to pizza delivery. This is an easy to read book, with a twist and a turn that isn’t expected. It has the greedy power mongers vs the caring dragonslayer, and it doesn’t fail to deliver. I enjoyed this book immensely, and I think it would make a great gift for Christmas especially a young adult, or someone who enjoys a bit of fantasy (but not too much and more tongue in cheek, than the usual fantasy fare0.